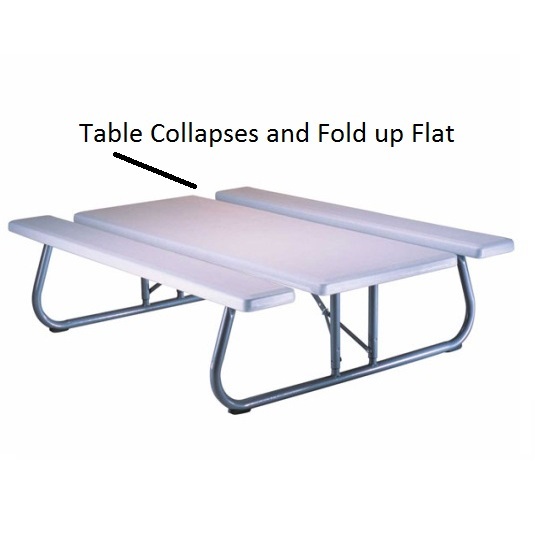 Lifetime Picnic Tables - 80215 Folding Picnic Table 6 ft. White Top. *We will beat any online competitor's advertised price by $10 for this Lifetime picnic table. This listing is for 1 qty. 80215 Lifetime picnic table. 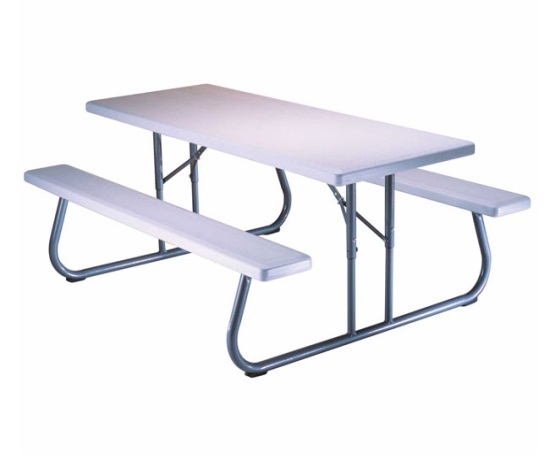 Lifetime picnic tables features a polyethylene plastic table top and a steel folding frame. The 80215 table top is a white granite color and the folding frame is a hammertone gray. With a powder-coated steel frame, this 6 ft. folding picnic table is suitable for indoor and outdoor use. Typically, this table can seat 6 adults comfortably, 3 on each bench. 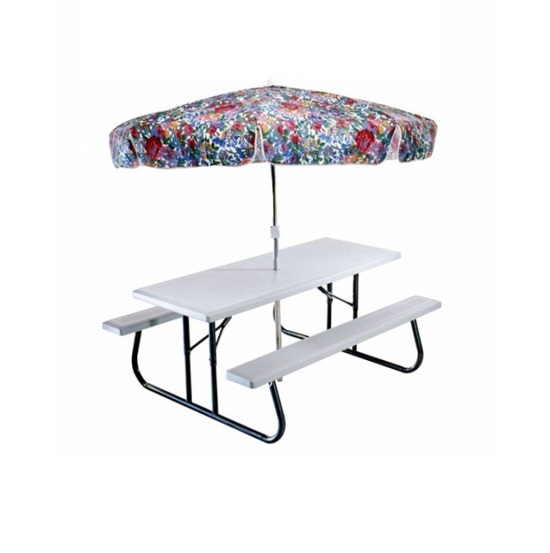 This table is umbrella-hole ready, with a cap to use to cover the hole when not in use. This picnic table meets or exceeds ANSI/BIFMA standards. Polyethylene plastic table top will not fade, crack, or peel in the sunlight. Powder coated steel helps resist rusting. 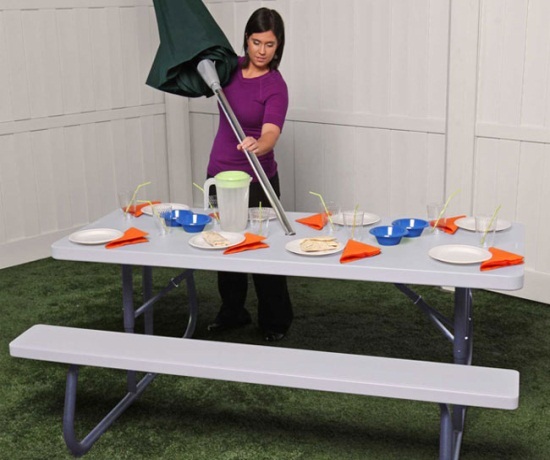 Folding picnic table frame allows the table to fold down flat for easy storage. Comes with 2 year manufacturer warranty from Lifetime Products. Umbrella hole ready, with plastic cap to cover the hole when not in use. Table top dimensions: 72 inches x 30 inches. This table can typically seat 6 adults comfortably. Folded dimensions: 72 inches x 57 inches x 4 inches. Bench dimensions: 72 inches x 9 inches. Bench open position height: 19 inches. 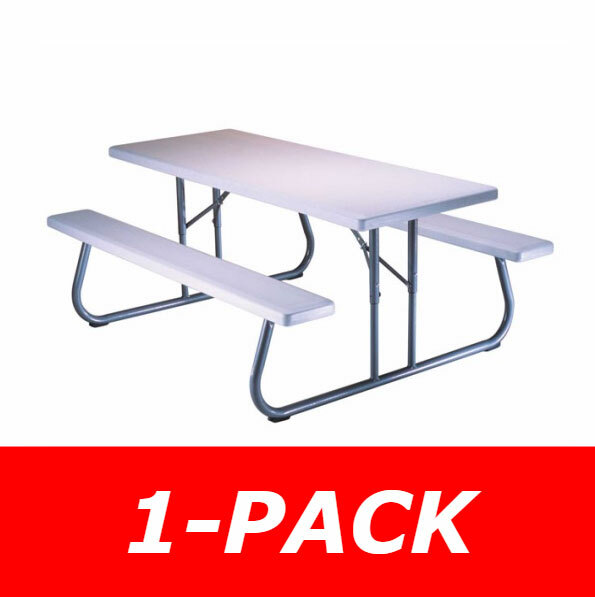 I have used many Lifetime 6 foot picnic tables and they are awesome. They fold flat for storage and they are comfortable to sit on and very affordable. Q: are there 5 available and is there any discount if we buy 5? A: The cheapest way should be getting a 4 pack and then a 1 pack. Q: Does this include an umbrella hole? A: Yes, and it also includes a cap to cover the hole if you do not use an umbrella. Fast Shipping: Orders for the Lifetime 80215 generally leave the warehouse within 1-2 business days. Dimensions: 73" x 31" x 9"